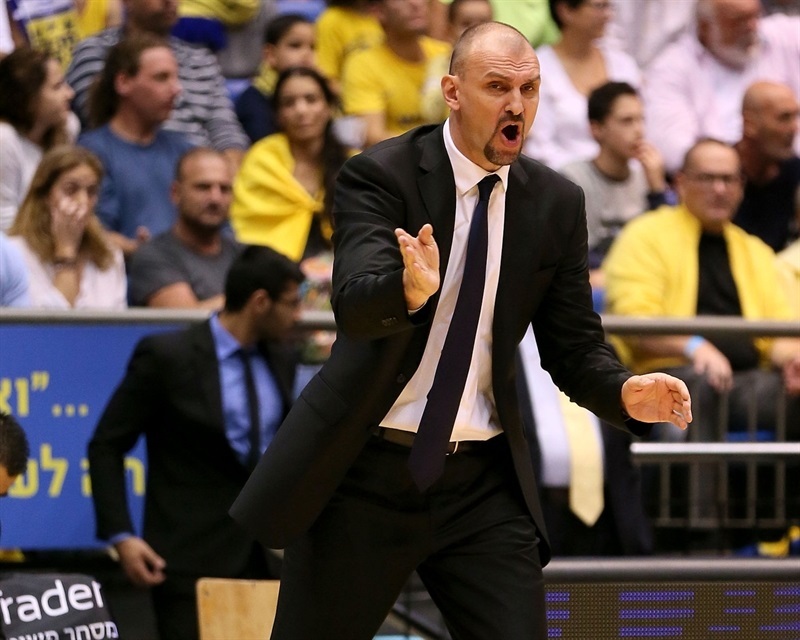 CSKA Moscow spoiled the debut of new Maccabi FOX Tel Aviv head coach Zan Tabak with an 82-88 victory at Menora Mivtachim Arena on Thursday night. Milos Teodosic scored 19 of his game-high 25 points in the first half as the visitors survived Maccabi’s aggressive start to lead 37-38 at halftime. After a back-and-forth third quarter, a pair of threes by Cory Higgins and another from Teodosic helped CSKA pull away for good and stroll to a 5-1 record, which is good for at least second place in Group D. Also, CSKA will now qualify to the Top 16 with one more win, or one more Dinamo Banco di Sardegna defeat. This loss dropped Maccabi to 1-5. 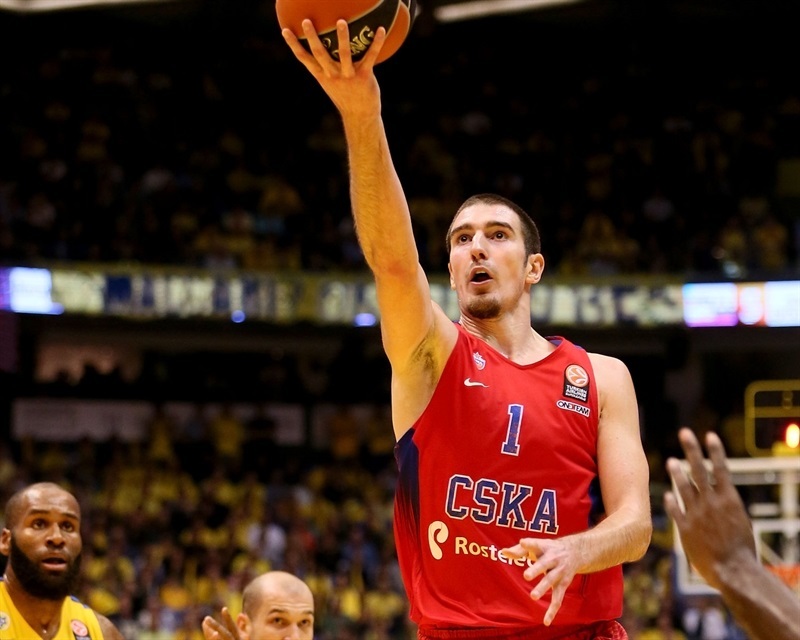 Nando De Colo added 15 points and Vitaly Fridzon 12 for the winners, who made half of their 22 three-point attempts. Taylor Rochestie paced Maccabi with 20 points, Brian Randle scored 19, Ike Ofoegbu 15 and Devin Smith had 14 in defeat. 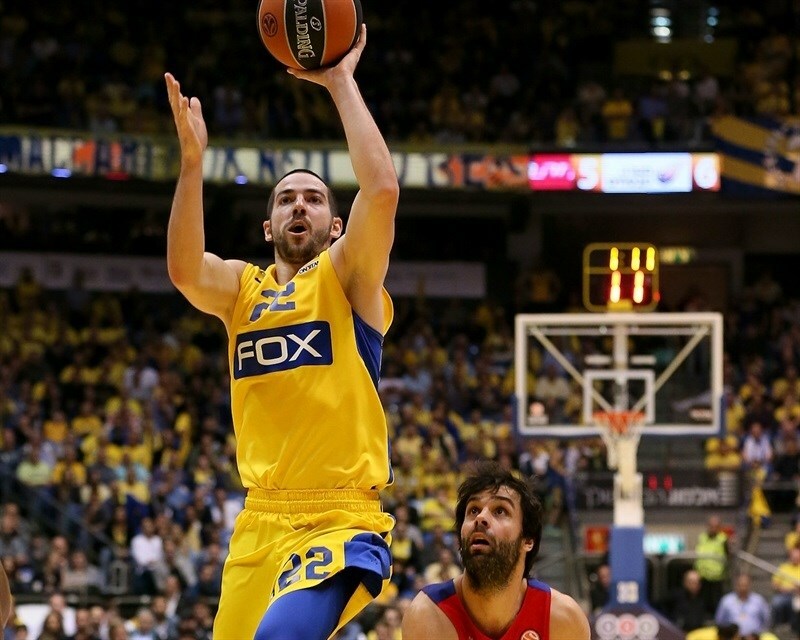 Maccabi’s guards forced a steal that led to a Smith layup to open the scoring. De Colo’s crisp pass to Fridzon inside got the visitors on the scoreboard. Both teams were playing aggressive and physical defense, so when Randle banked in a shot, it was only 4-2 after three minutes. 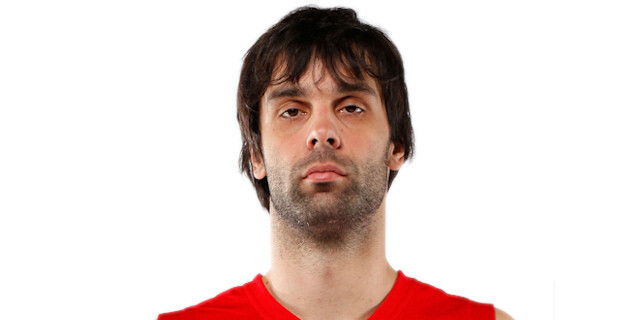 Teodosic, fresh off the bench, got to the line for 2 free throws to tie it at 4-4 midway through the quarter. Randle was fouled on the break and sank the resulting free throws to the hosts back ahead. Trevor Mbakwe added free throws and Randle scored on the break before CSKA called timeout down 10-4. Teodosic and Ofoegbu traded free throws before the former trimmed the gap to 12-8. De Colo made it a 2-point game, but Ofoegbu kept the hosts rolling with more free throws. 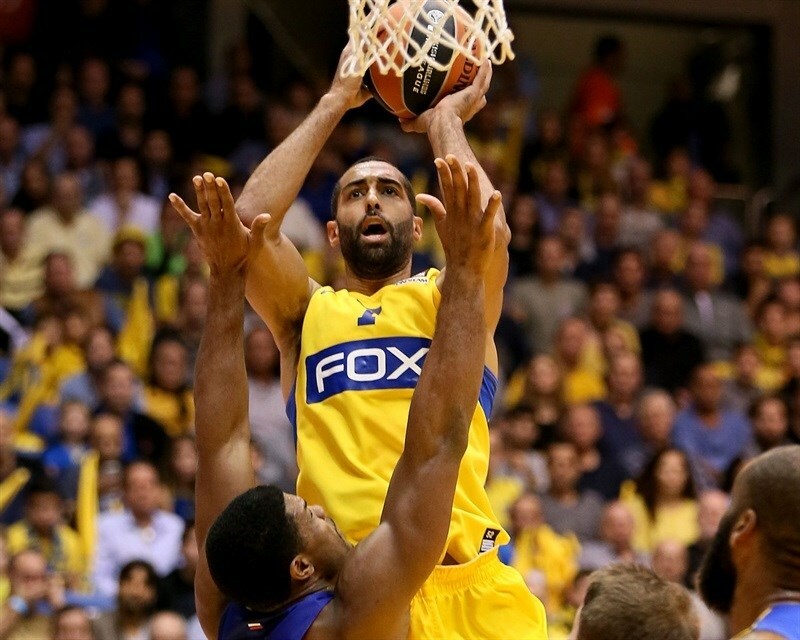 Ofoegbu’s put-back and Rochestie’s floater after a Yogev Ohayon steal put the hosts up 8. De Colo’s triple on the buzzer made it 18-13. Ofoegbu turned another offensive rebound into 2 free throws, but Teodosic and Pavel Korobkov drew the visitors within 3. De Colo’s scoop shot made it 20-19, but Rochestie’s step-back jumper kept the hosts ahead. Korobkov entered the highlight reel with a dunk over Smith. Randle took charge with free throws at one end and a pair of rejections at the other. Rochestie made a circus shot from the corner, but Kyle Hines shined with a massive two-handed jam. Cory Higgins free throws made it 26-25 midway through the quarter. 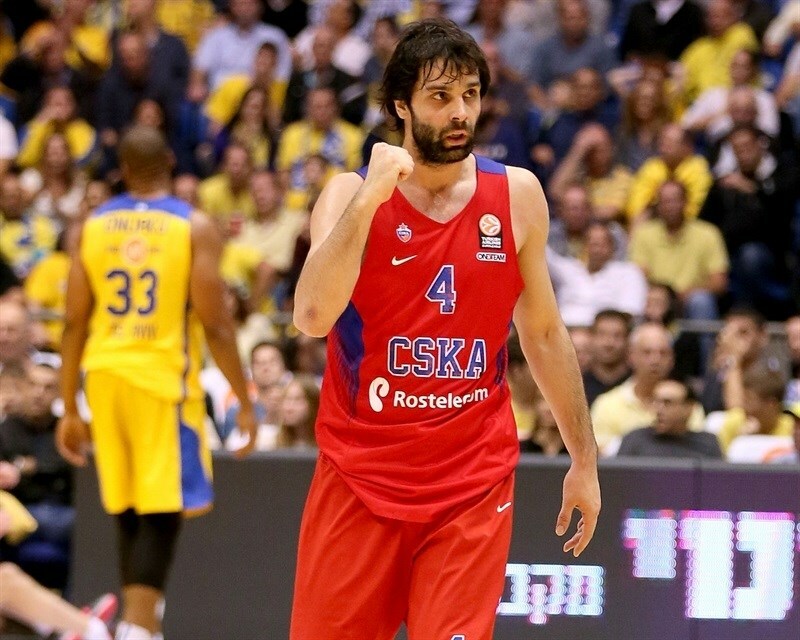 A Teodosic triple gave CSKSA its first lead, 26-28. Teodosic added 2 more from the foul line before he and Rochestie traded threes. Ofoegbu missed twice from the line and Fridzon made a pair to extend the difference to 6. Smith halved the deficit with a triple from the corner. Randle turned Ohayon’s long pass into a layup that made it 34-35. After a timeout, Teodosic buried his third three, but Guy Pnini matched him and the teams went into the locker rooms for halftime with the scoreboard showing a 37-38 CSKA edge. Arinze Onuaku found a cutting Randle for a layup, but he soon committed his third foul. 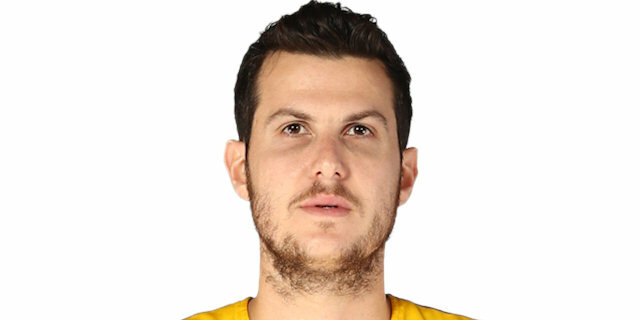 Friddzon went into the paint for a layup before Randle added 2 more free throws. Aaron Jackson used his speed to get a layup before Onuaku scored on the offensive glass. Ohayon made a layup for his first points and Teodosic whipped an assist to Andrey Vorontsevich inside. Ohayon limped while favoring his ankle. Smith drew a foul shooting a triple and made 2 of the resulting shots to make it 47-44. 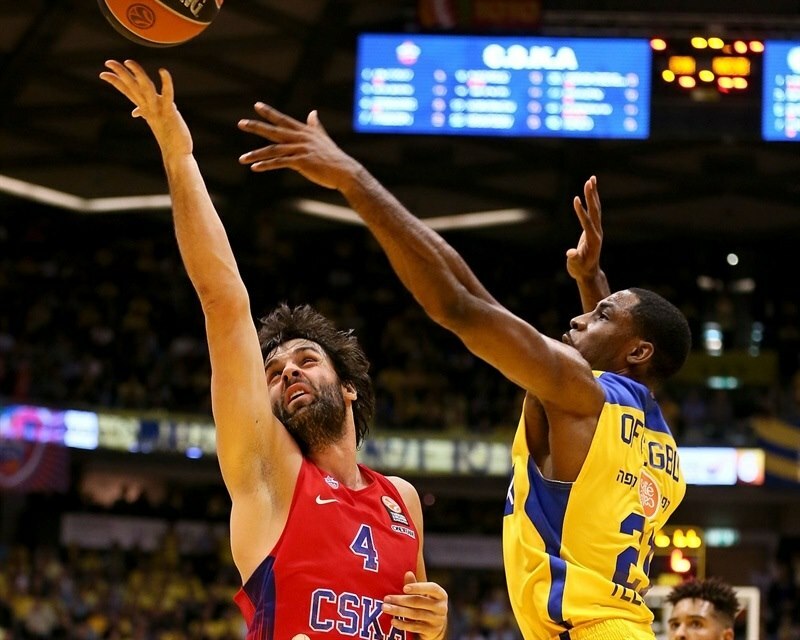 Randle raced down court for another fast break dunk, but Teodosic responded with his fourth three-pointer. Onuaku and Smith each split free throws, but De Colo’s wide-open three-pointer from the corner made it a 1-point game. After a long Rochestie jumper, Fridzon tied the game at 53-53 with a three-pointer. A series of great passes led to a Fridzon three-point play. Vorontsevich nailed a three from the elbow and a technical foul on Rochestie enabled De Colo to cap a 0-10 CSKA march with a free throw that made it 53-60. 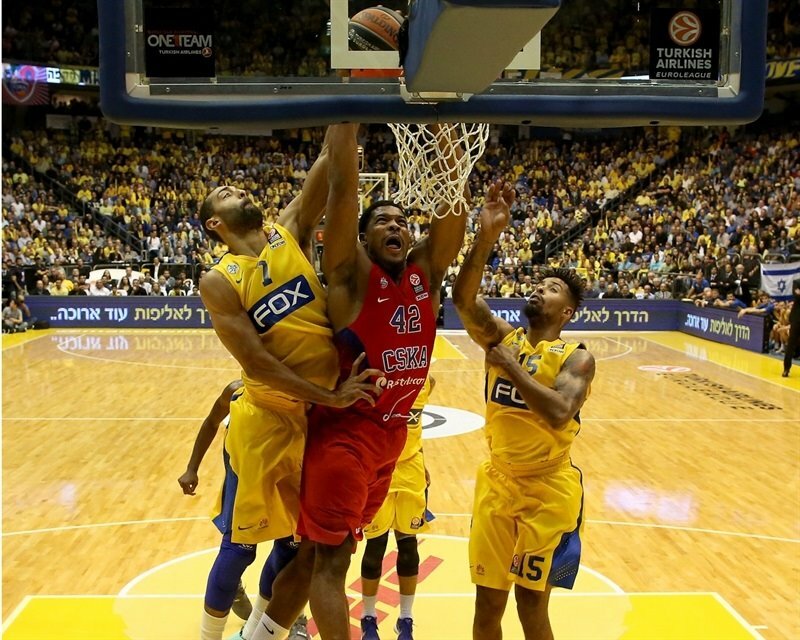 Ofoegbu awakened the Maccabi fans with a triple and Sylven Landesberg added a pair of free throws. Vicheslav Kravtsov dunked off an inbounds play, but a Rochestie triple made it a 1-point game. Rochestie missed his next three, but Mbakwe pounced on the rebound and gave it to a cutting Rochestie to put Maccabi back ahead 63-62. Free throws by Higgins and Jackson put the visitors up 63-65. Higgins drained a triple from the top of the key. Nikita Kurbanov drew Mbakwe’s fourth foul and sank 2 free throws. Another three by Higgins gave CSKA a double-digit lead. Hines missed 2 free throws that could have added to the lead. Higgins left the game with 5 fouls, after which Smith sank a jumper. But Higgins’s replacement, Teodosic, reached 25 points with a triple over Ohayon that made it 65-76. Ohayon assisted Smith on a cut that led to 2 free throws. Randle split free throws before De Colo’s layup put the difference at 10 again. 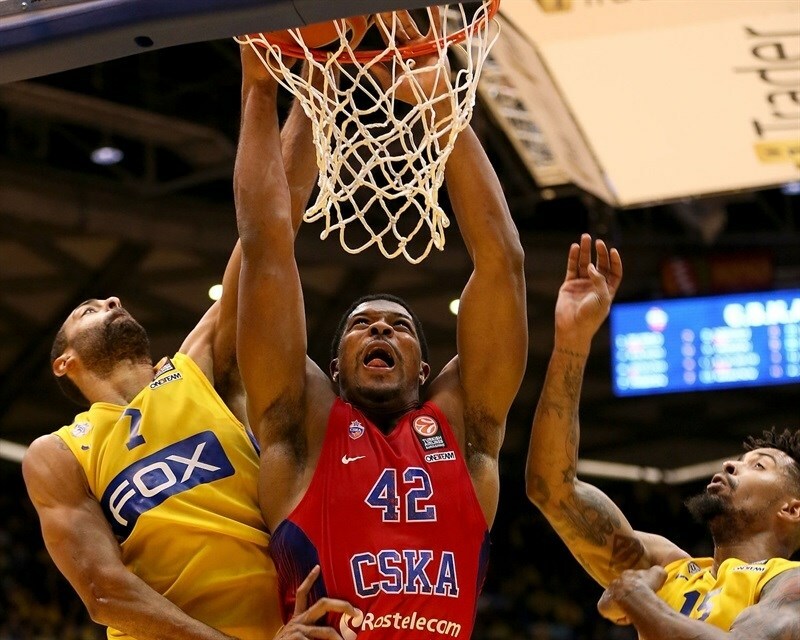 Vorontsevich’s fast break dunk kept CSKA in control. Landesberg hit a jumper and Rochestie added a bucket to make it 74-83 with a little over three minutes to go. Hines tipped in his own miss and De Colo netted free throws to practically wrap up a victory with a 13-point lead and two and a half minutes to go. 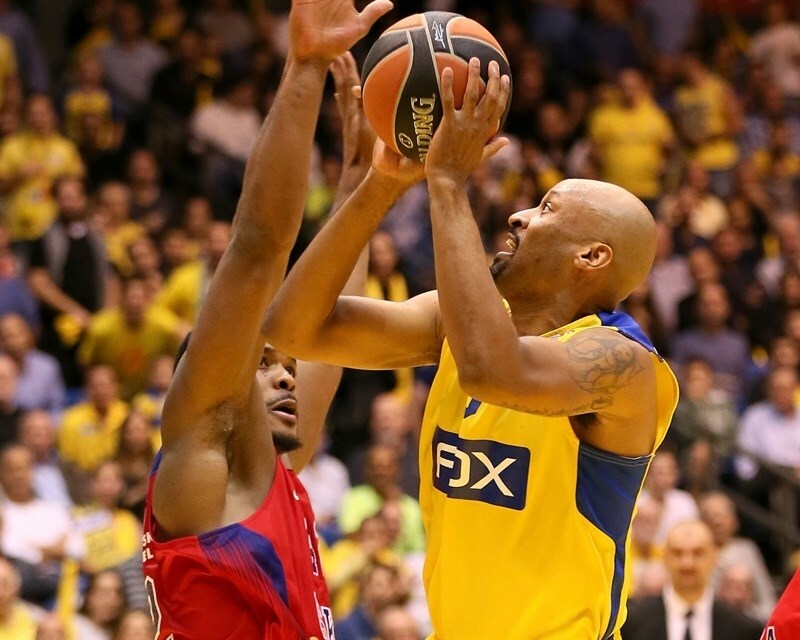 Smith drove for a layup and Randle cut the deficit to 9, but it proved to be too little, too late for Maccabi. "There are two aspects of this game. The first aspect is that we lost the game. Result-wise this was really important for us and we wanted to get one step closer to qualifying for the Top 16. And that’s important because of the situation we’re in right now. That’s the negative. The second one is a positive because of the team effort the team gave from minute one to the last minute, I have a feeling that my team gave 100% effort. There were mistakes that we made. But more than anything I think that the biggest difference was at the moment we physically went down. I am asking of them to play a kind of basketball that they are not used to. " "I think that the second and third quarters meant a lot for us. We established some good things and actually started to build confidence with what we did defensively and offensively. It definitely helped that we made some tough shots, especially Milos and Nando and Vorontsevich and Fridzon. When we started playing our game, with drives and kicks, we did spread the floor. And we played against a team that is really passionate and had the help of an amazing crowd. Congratulations to the crowd: this is what basketball actually needs. And congratulations to my team. That's another good and big road victory. But it's a long road, a marathon like I say from the beginning." "From the start of the game, we played with a level of energy that I don’t think we had before. But we lost. We lost to a very good team, but still we lost and now our situation is even tougher. We really wanted to win today and you could see that on the court. I believe and our coach said that is we continue the way we played today our situation will be okay. " "It was a very tough game for us. All 40 minutes it was a tight game. Maccabi has a very good team, although maybe they are not playing very well right now. I'm happy that we won tonight. It was an important win for us and we need to keep playing like this. I feel this is a team win and a team game and I'm happy we won."